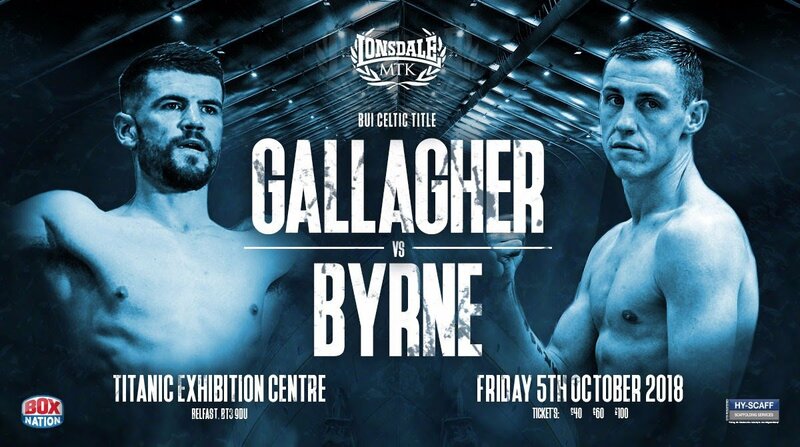 Paddy Gallagher will face Jay Byrne for the BUI Celtic crown at Belfast’s Titanic Exhibition Centre on October 5 – live on BoxNation. ‘Pat-Man’ (13-4-KO8) has quickly overcome a broken jaw and goes straight in to a title fight against Dublin’s Byrne (7-5-KO2) on a huge card that also includes Tyrone McCullagh bidding for the WBO European super-bantamweight belt. Gallagher said: “I think this will be an absolutely cracking fight. I only ever met him once. We occasionally text each other to say ‘good luck’ or ‘well done’ but I can’t wait to get stuck into him verbally as well as physically. “To be fair to him, he’s already shown a good bit of sportsmanship texting me and wishing me all the best. He’s a credit to boxing and has never shied away from a fight. He’s a bit like myself so we’ll go to town on each other. “I only ever seem to fight nice guys but this will sell tickets anyway as it’s north against south and there’s a significant title on the line. Byrne has been about and in with some top prospects like Josh Kelly and Anthony Fowler. It’ll be a tough test but of course I’ll do a job. “My jaw is perfect. It’s been more or less three months exactly. I’ve been training away and now I’m starting sparring. The doctor said it would heal after 10 weeks and we gave it 12. I believe it’s good as ever.